Labor day symbolizes the unofficial end of summer. It’s a time to go to the beach, BBQ, and of course hang out with friends and family. Another symbol of summer is the Frisbee. Surely these discs can be seen at a beach or park near you, so why not take the next step for Labor Day and try a new sport: Disc Golf. In today’s article we take a look at the history of the sport and give you a few disc golf tips to get you started on your way. Where did Frisbees come from? Back in 1938, Fred Morrison and his future wife Lucile discovered that there was a market for the flying disc when someone offered them 25 cents for the cake pan they were tossing back and forth on a beach in New Haven, CT. Throughout its history, this famous cake pan had many names. Once called the “Flying-Saucer” in the wake of reported unidentified flying object-sightings, it then progressed to the “Pluto Platter”. In the end, just leave it to college kids to coin a catchy name that would stick. Though many played with the official “Pluto Platter” discs, Northeastern U.S. college students had nicknamed these discs “Frisbies” after the local CT-based pie manufacturer, Frisbie Pie Company. Their pie tins resembled and were even used by some as flying discs – so why not call them “Frisbies?” In 1957 when the actual disc companies found out about the popular nickname, they patented it (like any big business would do) and set the spelling a little different as “Frisbee.” Popularity continued to grow and so multiple sports began to form. One of these sports was Disc Golf. Created by a recreation counselor named George Sappenfield of Thousand Oaks, California in 1965, he realized that kids could play “golf” with Frisbees. He set up an object course for his children to play on. Many of these early courses were set up using anything from lamp poles to fire hydrants as targets. When George finished college in 1968, he became the Parks and Recreation Supervisor for Conejo Recreation and Park District in Thousand Oaks, California. That was when he introduced the game to adults by planning a disc golf tournament…and from there the sport evolved into what it is today. Bob Hope once said that “Golf is a good walk gone bad.” If that’s true, then Disc Golf is a good hike made excellent. 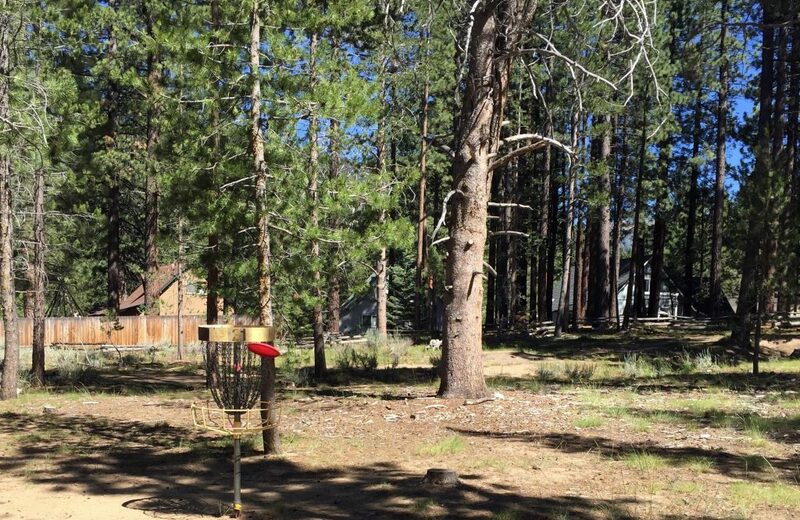 Throughout ski-towns in North America, nearly every one of them has at least one Disc Golf course. Shane checking out his next throw as well as admiring the view from the Bijou Disc Golf Course. 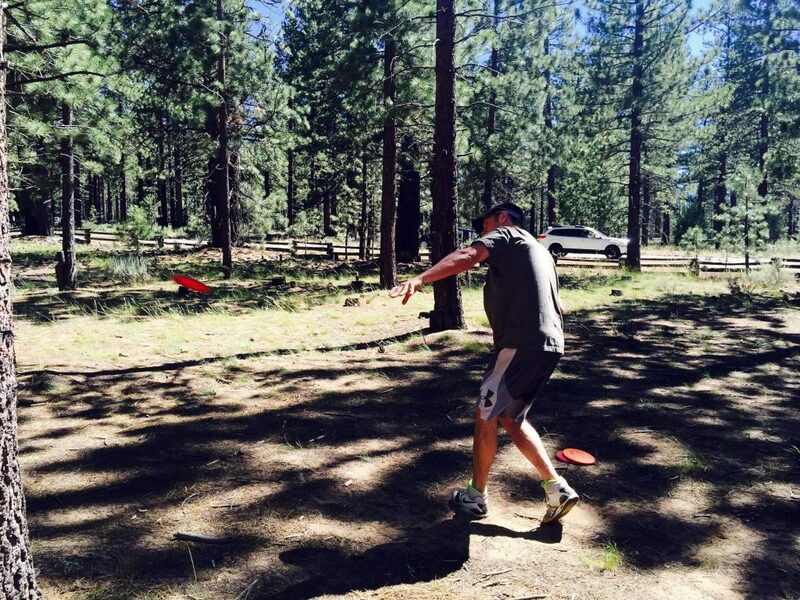 So, what exactly is Disc Golf? Similar to golf, there is a series of holes (disc golf baskets) with predetermined pars (set of throws) to get your golf ball (disc) into the hole (basket). For Disc Golf, each hole has a sign telling you the distance to the basket and how many throws you get so no guessing – you will be an informed player. Normal Golf is an expense sport to play. From buying golf clubs and needing to pay “greens fees”, you can easily spend thousands of dollars without blinking an eye. Disc Golf on the other hand is a ridiculous bargain. For around $40, you can purchase a set of discs and then head over to a public park and play the sport for FREE or maybe pay a few dollars at some of the more majestic courses. Talk about a great deal and an awesome time! These can be purchased at any typical sporting goods store. If you are in South Lake Tahoe, Tahoe Sports LTD offers a good selection. On the North Shore, Tahoe Mountain Sports has the best overall selection ranging from Innova, Discraft, and Vibram brands. To help with your selection, each disc will be marked if it’s a putter, driver, or mid-range disc along with other fun (and important) facts. Ranked from 1 to 14, 14 being the fastest, this is the rate at which a disc can travel through the air. The faster the disc, the more it can cut through the wind and help in head-wind conditions. Slower discs, on the other hand, take more power to throw upwind, but are easier to throw more accurately and may actually go farther downwind. High speed discs are not recommended for beginners as they require more power to control properly. Glide describes the discs ability to maintain loft during flight. Discs with more glide are a great choice for new players as it will help get you maximum distance from your throws. Beginners wanting more distance should choose discs with more glide. Just note, discs with less glide are actually more accurate in high wind situations. High Speed Turn is the tendency of a disc to turn over or bank during the initial part of the flight depending on how you throw. The disc will curve right for a Right-hand Backhand (RHBH) or Left-hand Forehand (LHFH) thrower. Opposite for a Right-hand Forehand (RHFH) or Left-hand Backhand (LHBH) thrower – it will curve left. A disc with a +1 rating is most resistant to turning over, while a -5 rating will turn the most. Discs with less turn are more accurate in the wind. Discs with more turn (-3 to -5) are easier to throw for beginners. For a RHBH thrower, Low Speed Fade is the discs tendency to hook left at the end of the flight. Fade is rated from 0 to 5. A disc rated 0 will finish straightest, while a disc rated 5 will hook harder at the end of the flight. High fade discs help with distance precision, not max distance, but don’t fear the ‘fade’. It can help your disc finish in the line you intended. Every state and province in North America has amazing disc golf courses, but ski-towns bring it to the next level. They do this by giving you amazing views, beautiful scenery and the ability to squeeze a hike in WHILE you are playing the sport. 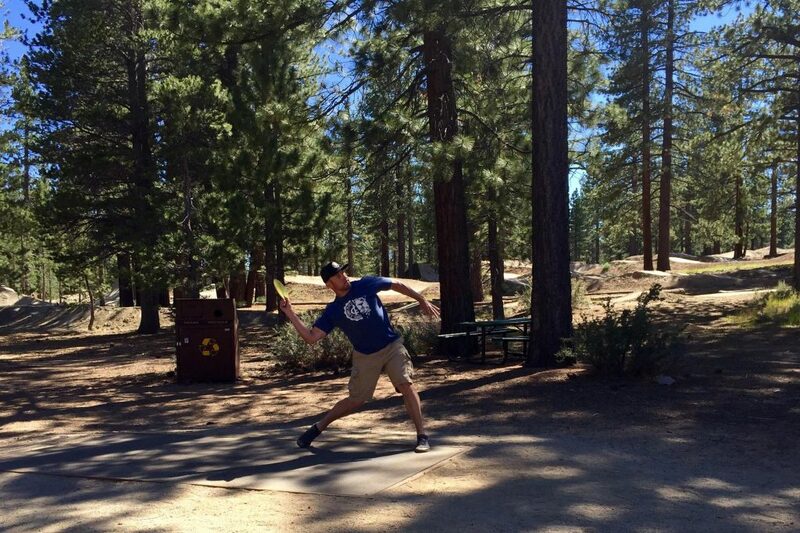 Be sure to check out our Best Ski Resort Disc Golf Courses in North America to get a better look at them. One last thing to highlight is that Disc Golf is more about technique then power. We learned that the hard way… So before even stepping onto the course, we highly suggest watching some videos. Here’s one to get you started. Have fun! 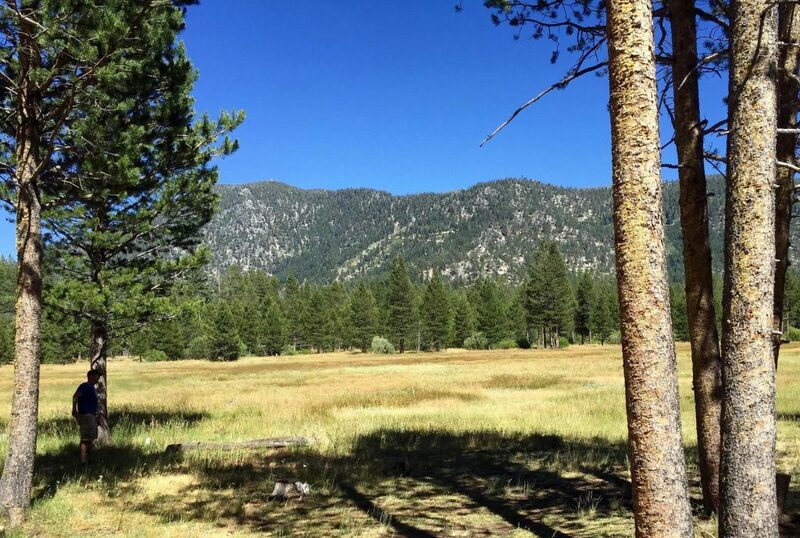 A beautiful course and a hike all in one. Testament to its challenge is its fourteen hundred foot 16th hole! It has a short June to October season, but opens just in time to catch the wildflower bloom. Of course, except for the first hole, you want to avoid the wildflowers. They’re usually a sign of a shot gone astray. Kirkwood has eighteen holes and all but three feature a significant elevation change. The remaining three just happen to end up at the same level, so don’t misread that as they are flat or easy.